Between all the turkey and tinsel, the past two months here at the office have been a whirlwind. But we’re finally back and ready to catch you up! 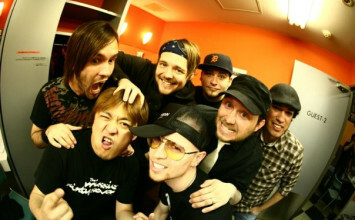 You can expect to read about as many hard-hitting achievements as our Updater trademarked fun. 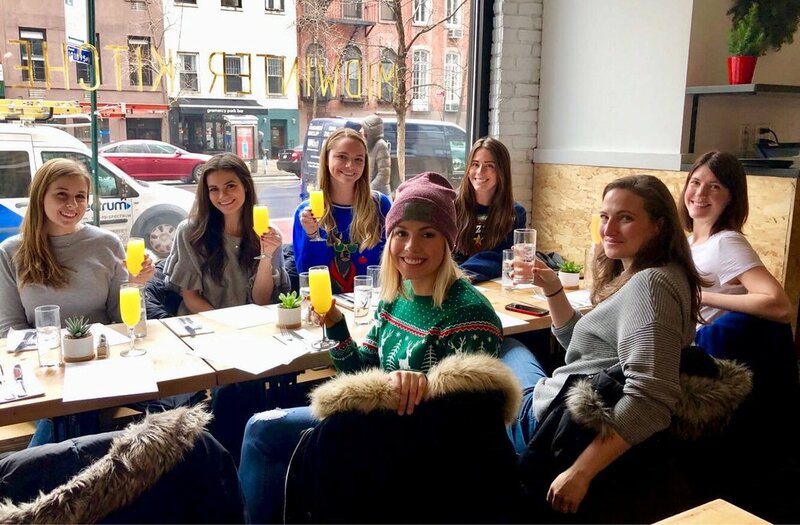 From crushing conferences to being one of the best places to work in NYC, to getting into the holiday spirit, the past 60 days have been nothing short of awesome. In November, our team set out to the annual National Multifamily Housing Council’s (NMHC) OPTECH Conference and Exposition in Orlando. Members from our success, sales, and marketing teams all attended. This golden group took the floor along with thousands of other industry experts for a weekend of learning the latest advancements in the multifamily industry. From property operations to technology and sustainability, the team walked away with lots of newfound knowledge. Throughout the conference, team members got the chance to speak with our incredible clients and partners and spread the word about our exciting new features. 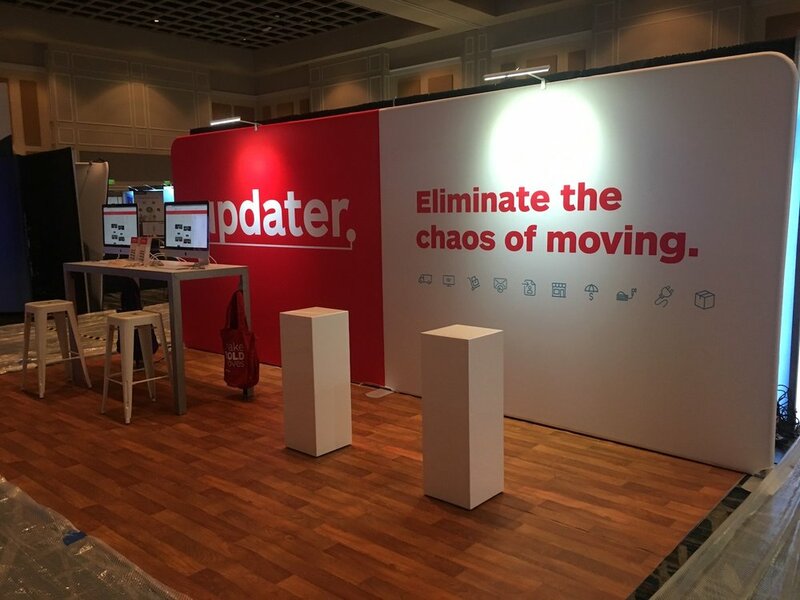 We loved chatting with them and hearing what they had to say about Updater. The team was also impressed with the forward-thinking content and motivational discussions that drove the conference and were eager to share their takeaways with the rest of the team. OPTECH, you did not disappoint. Thanks for having us, NMHC! Our very own team members of the Real Estate Division, attended the National Association of Realtors (NAR) Conference in Boston this past November. They entered Beantown ready to network with the best in the real estate biz. And of course, to catch up with our amazing clients and partners. Our Updater all stars also got to film testimonials with some of our awesome clients: Brik Realty, McEnearney Associates, and Realty Executives International. 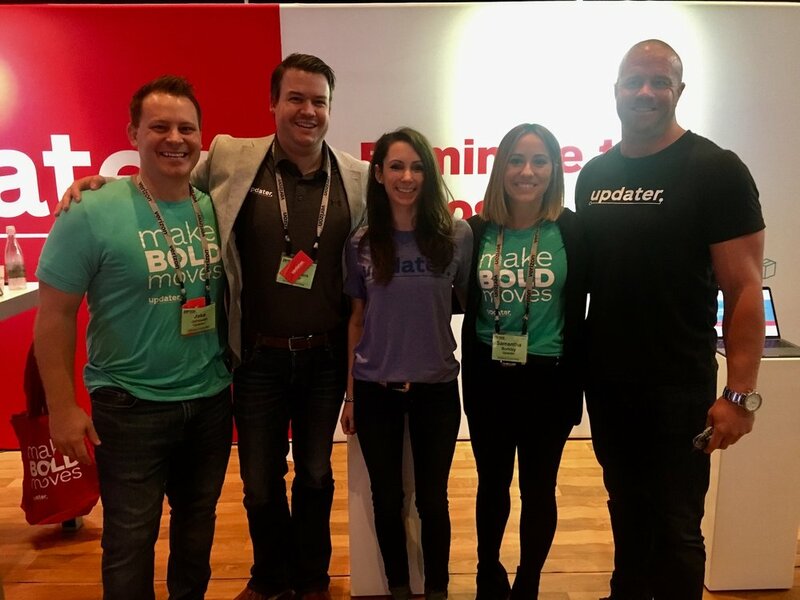 It was a pleasure meeting so many brilliant people and working with some of our clients to spread the good word of Updater. Thanks, NAR! For the second time, we’ve been named one of the best places to work in NYC by Crain’s New York Business. Entry surveys were dispatched to over 23,000 local employees, covering topics such as working conditions, benefits, and corporate culture. Company surveys were then evaluated alongside responses from employers to establish the top 100 list. Out of those 100 companies, we landed the lucky #7 spot in the mid-sized category! We couldn’t be more proud of this tremendous accomplishment. The leading ladies of our People and Marketing teams, Lindsey, Ashley, Jenna, and Amanda attended the awards ceremony at The Roosevelt Hotel in NYC. They loved spending the day surrounded by so many inspiring companies who are making waves in their industries. Congratulations to all of the winners! You can read more about this incredible honor here. 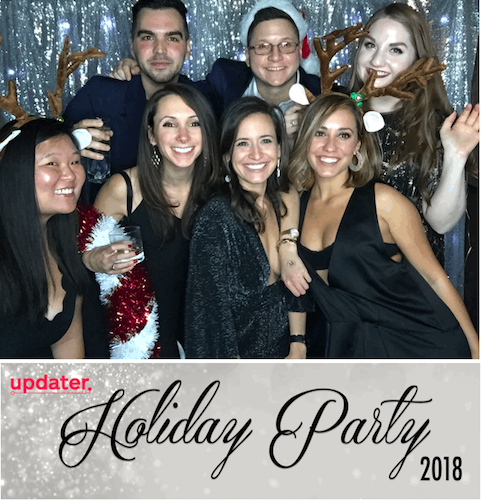 There’s no holiday party like an Updater holiday party! To celebrate the holidays, our entire team got together for a memorable night at The McKittrick Hotel in NYC. Complete with delicious food and drink, non-stop dancing, a photo booth, and even a glow-in-the-dark violin performance, our team was filled with plenty of good cheer. It was the perfect way to ring in the holidays. A very special thanks to our unstoppable People Experience Coordinator, Ricki and People Experience Manager, Ashley for putting on a night to remember for our team and their guests! Lights, camera, action! Our marketing team got to work and brought in some expert filmmakers to create a fun and exciting glimpse into all things Updater. Many team members got to help our vision come to life as they jumped in and read the script. We even shot a canine cameo of one of our beloved Pupdaters, Ace! Big shout out to Amanda and Deborah for keeping things running smoothly. Stay tuned for the final products — we’re excited about this one! Is there anything more festive than an ugly Christmas sweater? We think not. 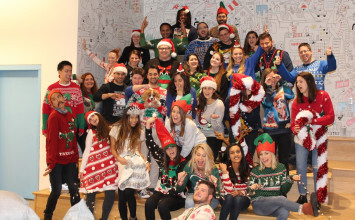 To get in the holiday spirit our team wore their very best (or in this case, very worst) sweaters into the office for a day. 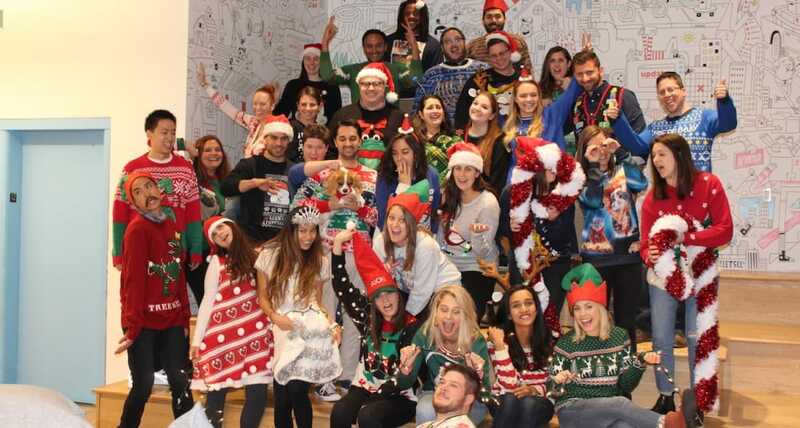 From Buddy the Elf, to Festive Pizza, the sweater designs we saw come through the door kept us on our toes. Enjoy this photo of the entire team sporting their sweaters! 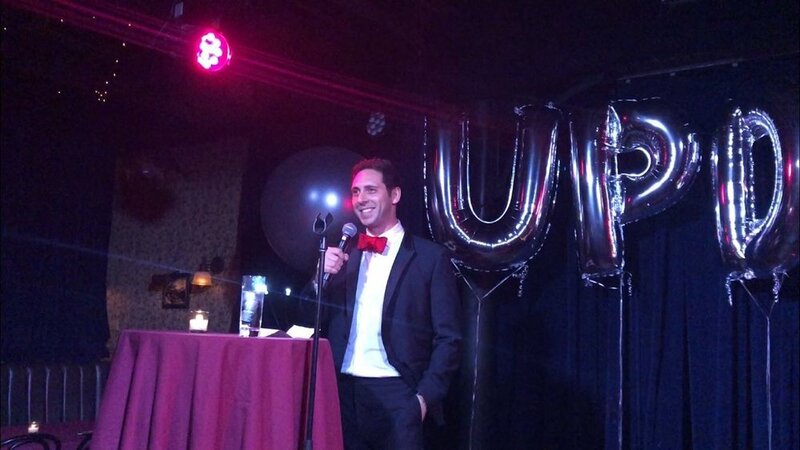 Last but certainly not least, us interns got a fun surprise to wrap up our fall semester with Updater. We headed to Midwinter Kitchen for a delicious brunch filled with chorizo hash and poached egg goodness. We said our farewells to our dazzling Content Intern, Haley, who’s been with us for two semesters, and to our rockin’ Events Intern, Paige, who we’ve loved having this fall! A special thanks to our Marketing Coordinator, Emily, for planning this amazing afternoon. We love our Updater family and are so thankful to have spent our fall semester with them. What a way to close out the year! We can’t wait to see what’s in store for us next. Stay tuned by connecting with us on Twitter, Facebook, LinkedIn, and Instagram.